there wasnt too much else to see by randall’s uncle’s house, so we decided to go sightseeing in hiroshima today. the first thing we saw there was the a-bomb dome. 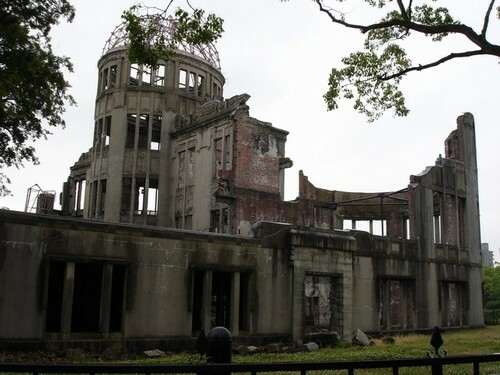 this was a building that was practically right under the atomic bomb when it was dropped. everything for miles around this building was reduced to rubble, but a large section of this building was still standing. we then went on to check out the peace park, a monument to all those who died, and the peace museum. it’s so difficult to comprehend how much damage this one single bomb did to hiroshima. 140,000 people died in the first few days alone, and then many more died later from radiation etc. we saw this one display that was all artwork drawn by survivors of the bomb. it was such a depressing sight. tales of dead bodies everywhere, people with crazy radiation burns, families being reduced to nothing. one of the really eerie things were the many watches that were displayed in the museums here. all of the watches had stopped at exactly 8:15, the time that the bomb dropped. it’s so absolutely insane to think that in this one moment, a whole city was practically leveled and life stopped for so many people. everything just stopped. in a lot of way, as an american, i felt really awkward walking around and looking at all this stuff. back in israel, when we had gone to the holocaust memorial, walking around i felt like i was one of the victims. of course, i didnt live during the war, but i am jewish, and a lot of victims fo the war were my people. here it was the opposite. all the dead here were *because* of my people. america is the only country *ever* to bomb a city w/ an atomic bomb. it just seems so shameful that we could do such a thing, and kill so many people, especially since so many of them were innocent civillians. walking around the museum,　i almost couldnt look people in the eye. all the japanese people here, wandering through the museum learning about the devastation that america did to their city… what could all of these people think of us? as is always the case in tourist destinations here, we got interviewed by several junior high kids learning emglish. i was almost reluctant to tell them where i was from. i’ve never been as knowledgable about history as i should be, but i learned some really disturbing stuff there about our decision to drop the bomb. the bomb was developed because we were worried that the germans were developing and a-bomb and we thought we needed one to protect ourselves from them. but then, the germans lost the war. we were left only fighting japan. at this point several factors went into play. our government needed some way to justify the 2 billion dollars spent on researching the bomb. if they used the bomb to end the war, that would justify the expenses. also, we wanted to end the war quickly, so that the russians wouldnt join in and spread communism. so we dropped the bomb. it’s so disgusting that 2 such political factors would motivate the decison to murder 300,000 people. ugh. but, at the same time… who knows. if we didnt drop the bomb, how long would the war have continued? how many more people would have died? it’s tough to tell really in the end whether the decidion made sense. but things got even more depressing in a new exhibit next to the museum. this exhibit told of the a-bomb tests we did at bikini-atoll. basically, we tested this crazy huge hydrogen bomb, many many times more powerful than the bomb we dropped on hiroshima. the bomb spread radiation all over the damn place, and the islanders that lived there all ended up w/ deformities, retardation, burn scars, etc. this museum was so depressing, especially cause all of the victime here were completely innocent. the US had no problem with them, yet we completely ruined so many of their lives. the photos had captions, lots of them w/ quote from the people who said how much they hated our country for doing this to them. ugh. Caryn, I had the same feeling Vlad discribed when I went to Nagoya (sister city to Los Angeles)to visit your Aunt Colleen in ’86. The people were all so polite and didn’t seem to hold it against us because they were all so young or not even born when that happened. I almost went down there but decided that it might be too strange. On the other hand, I found Japan’s depiction of their entry into the war as pretty funny in the Tokyo museum. No mention of Pearl Harbor at all–it was as if we were the first agressors. Did you see the War Crimes museum in Vietnam? Americans did that too–it’s pretty sick. Chemical warfare is disgusting. There were a lot of different factors in the decision to drop the bombs, and I don’t doubt that the decision weighed very heavily on President Truman’s mind. Truman went so far as to fire Douglas MacArthur for suggesting that they use an Atomic Bomb to bring an end to the Korean War. It was very apparent the Japanese would fight to the death/to the last man just like they did on every single other island that the americans attacked on their island-hopping campaign towards Japan. During the attack on Okinawa, an island just south of the main islands, civilians ran at soldiers with hand grenades in their hands, or under their armpits…so that when they were shot and an american soldier moved the body, the nade would detonate. Civilian women threw themselves off cliffs, carrying their babies to commit suicide. Nearly all the soldiers fought to the last man, inflicting many casualties on the American side but even more on the Japanese side, since by then the Japanese ‘soldiers’ were too ill-equipped and poorly trained to offer much resistance. To defend the main islands, divers were equipped with land mines tied to a pole, to destroy American landing craft. Civilians sharpened bamboo poles and were issued hand grenades to fight the invaders on the beaches. Japanese civilians were told proproganda of the atrocities the Americans would commit once they reached their shores, and to them it must have seemed like death was a better fate than suffering unmentionable horrors at the hands of the invaders. Based on the number of casualties suffered at Okinawa, researchers projected at least one million american deaths would be suffered in taking the japanese mainland, and countless Japanese civilians would suffer. Couple this with the fact that an increasingly-belligerent Stalin was preparing to invade the japanese main islands as well. Today, a mass air raid on a civilian population would be unthinkable and inexcusable. During that period of time however, that was the military model followed by nearly all the major powers. The objective was to destroy the enemy’s war-making capability (most production/manufacturing occured in dense population centers) and to destroy the enemy’s will to fight. (A dominant pre-war theory postulated that the civilian population, upon seeing the destruction of their homes and their lives, would become angry at their government and demand cessation of all fighting). Full-on daylight bombing raids on the main islands were in effect for quite some time, inflicting severe damage on a country whose residences were made almost entirely of wood. Truman may or may not have made the ‘right’ decision in dropping the bomb on Hiroshima and Nagasaki, and this is a subject of great debate even today. However, I had to play ‘devil’s advocate’ and alleviate the misconception that this monumental decision was based on monetary concerns. i dont know if it would have to do w/ age. fi something horrible had been done to my country, even if it was before i was born, i would still be angry about it. of course, i wouldnt hold it against the people who random tourists or anything though!